Hydrosols are the gentlest form of aromatherapy, safe to apply directly to the skin. They are a by product of the distillation process used to extract the essential oils from the plants. The water that remains carries all of the healing properties of the oil from which it was distilled, only in a smaller amount. Hydrosols contain all of the plant in each drop, similar to a hologram. 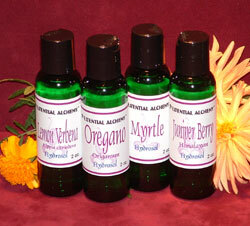 Hydrosols are not distilled water with essential oils added, as many floral waters are. Like the hydrosols above, they are the byproduct of the distillation process. However these hydrosols are derived from organic plants. These organic hydrosols are perfect to add to beverages for exciting new flavors and therapeutic benefits.